Turns out, Tito&apos;s Tacos wants everyone to enjoy their crunchy-shelled tacos, no matter what mode of transportation they take. 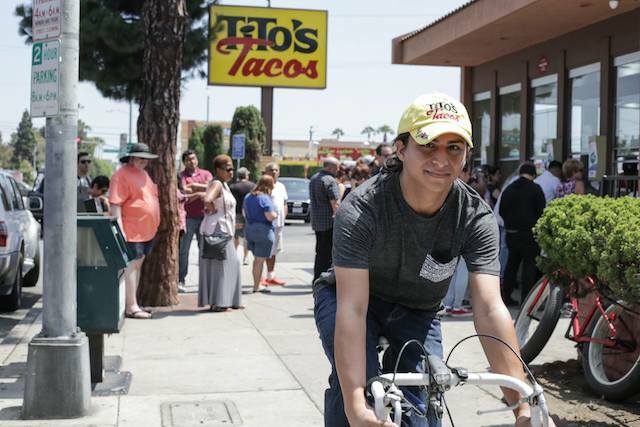 After receiving serious heat for demanding that CicLAvia be shut down, Tito&apos;s Tacos has announced that they are thrilled to welcome bicyclists and pedestrians at this Sunday&apos;s event. Owner Lynne Davidson initially expressed her outrage that Sunday&apos;s event—which will temporarily close Washington Place in front of her business—would force the 56-year-old institution to close, ruining "one the biggest days of the year" for them. It seems they were worried that by closing off the streets, their "regular customers" would have a hard time driving there from far off locales like "Santa Barbara, Riverside and San Diego counties." And because we all know nobody riding or walking by the stand during CicLAvia would ever want to eat tacos, right? But now, it seems the famed Culver City taco stand is suddenly downright enthusiastic about welcoming taco lovers of all stripes. Many of Tito&apos;s Tacos employees take public transportation and ride their bicycles to work every day for convenience and health reasons. We will be OPEN on Sunday, August 9th, from 10am to 10pm. Temporary bike racks will be provided by CicLAvia for cyclists right next to Tito&apos;s Tacos on Tuller Ave. We look forward to seeing you and we love you! It&apos;s amazing what a bit of Internet-shaming and a few donated bike racks will do to change somebody&apos;s tune. Now, as for that 56-year-old debate about whether Tito&apos;s serves the best or the worst tacos in town, that&apos;s not likely to be resolved quite so quickly.